Charity representatives receive some of the Easter eggs from local church ministers (left to right): Czarina Jacobs from SDAS; Louise Boyle, from Homestart; Julie Minter, student minister in Farlington; Canon Bob White, vicar, St Mary’s Church, Portsmouth; Kerri McGorrigan, Homestart co-ordinator; and Lin Kitchener, from the Roberts Centre. GENEROUS churchgoers from across Portsmouth donated more than 550 Easter eggs to help needy families. 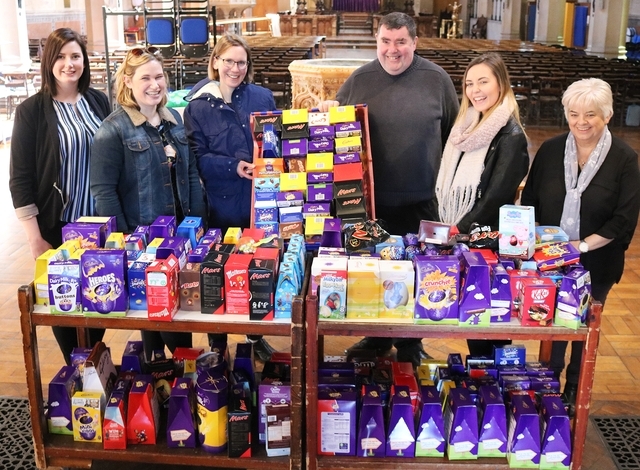 Worshippers collected donations of chocolate eggs from their churches, schools, colleges and workplaces to help those who might not be able to afford Easter treats. The Easter eggs have been given to help families supported by the Roberts Centre in Landport, and Homestart in Portsmouth, which both help vulnerable families; and the Southern Domestic Abuse Service (SDAS), which helps families where there has been domestic abuse. Representatives from all three charities picked up piles of Easter eggs from St Mary’s Church in Fratton. This is the fourth year that St Mary’s has led an appeal. Easter eggs were brought to churches throughout Lent by churchgoers from across Portsmouth.